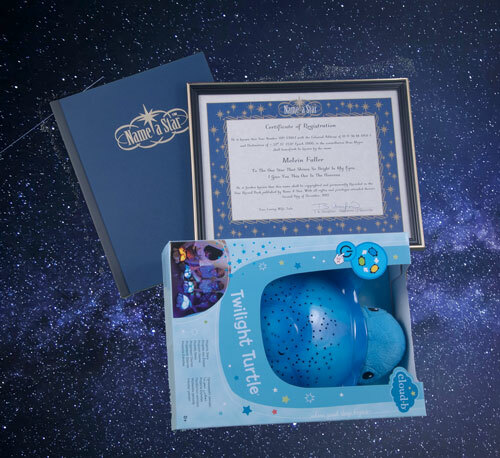 The ultimate child’s gift includes a beautifully framed star certificate and a soothing star projection toy that the child will treasure as they drift off to sleep each night. The Name a Star Deluxe Kids Package provides hours of fun and a deeper appreciation of the amazing night sky. 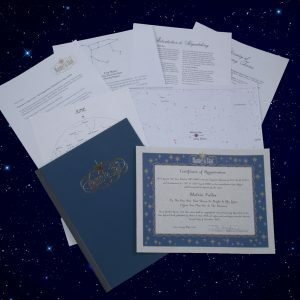 Beautifully framed Certificate of Registration customized by you with a personal message or tribute. A second certificate in a bound portfolio. 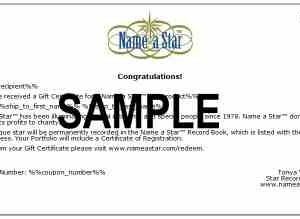 You get TWO Name a Star Certificates of Registration with the Deluxe Framed Package. One is bound in your Name a Star Portfolio and the other comes in the frame. 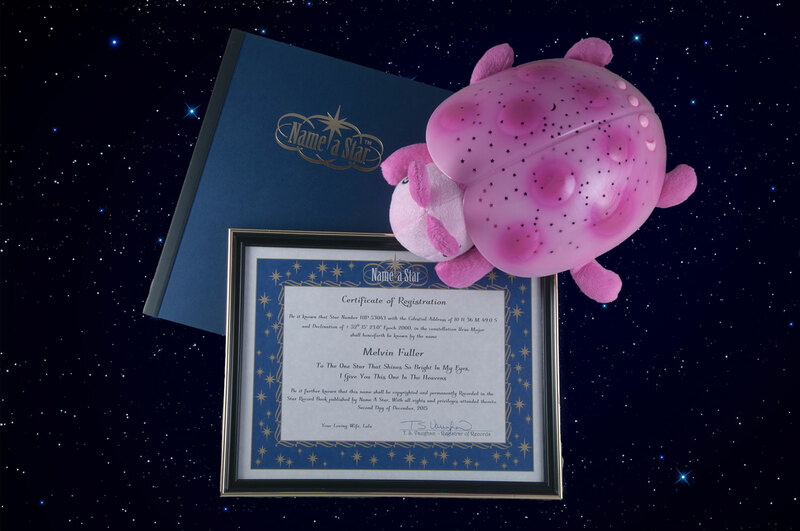 The Name a Star Deluxe Kids Packages will make a truly memorable gift. 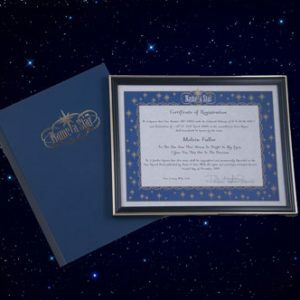 The Deluxe Name a Star Kids Package is $99.95 plus shipping. Order today and surprise that special child in your life. I was so excited to receive your Custom Kids Package! 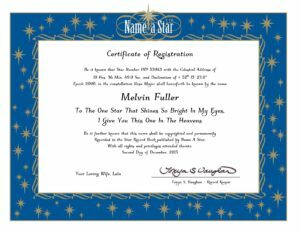 I never could imagine in a million years that my son could have a star named after him! What an exciting gift for he and I to receive! And, my little boy loves the Star Projection car that he received in the package…he sleeps with it every night! Thanks for your nice review. 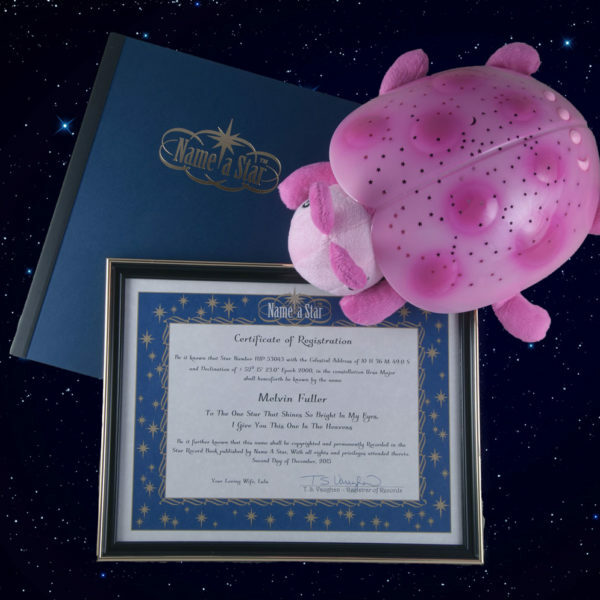 Happy to hear that your son is enjoying his Star Projection Toy and his very own star. I bought this package for my grandson with the red car toy because he really likes Lightning McQueen from Cars and has several cars from the movie already. He loved it! We (the family) took him outside and showed him the stars and explained to him that he has his very own star with his name on it up in the sky so when we sing “Twinkle, Twinkle, Little Star” now, we can sing it to his very own star. He was so excited and went to bed with his toy that night. I think this is a very innovative and thought-out package for young children and I am definitely planning on buying some more as Christmas gifts! Thank you for the detailed review. I am glad your grandson likes his Star Projection Toy and is learning about the stars. My Dad just loved getting his own star. Couldn’t think of a special gift for my Dad’s 80th, so at the last minute when I happened on Name-a-Star, it was easy and they were very helpful customizing for my Dad and getting it to me quickly. Thank you Name-a-Star!! The perfect last minute gift for someone who has almost everything!! It can be difficult to find a unique gift for an 80 year old. Glad Name a Star could help make your Dad’s birthday special.